Shines through with innovative Flat design and 5 amazing color schemes as well. More than that, this template has 9 additional pages, 3 types of layout with 2 styles: Wide and Boxed, RTL language and various content types. 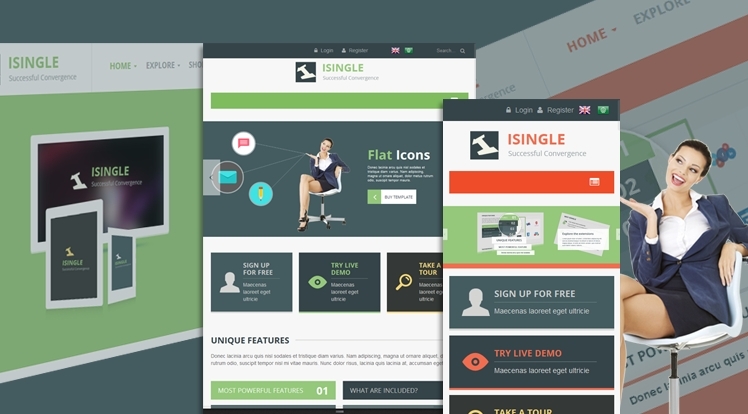 SJ iSingle has everything you need for creating any types of business site from simple to complex CMS projects, personal blog to the professional business portfolio site, or any technology products introduction website such as: Car, Tablet, Smartphone... You can also style personal site as the way you wish, of course. SJ iSingle is integrated with K2 component and a wide range of powerful extensions: SJ Dynamic Slideshow to show your product features with smooth transition effects, SJ K2 Simple Tabs to show categories as tabs right out of the box, SJ Mega K2 News to show news of many categories, Mega Menu - a powerful menu is included in YT Framework v2... You can be sure that your website will be stronger, not only with +9 extensions, but also with the beautiful design the joomla template offers. Build on YT Framework v2, this template is a totally responsive design as well as dozens of configuration options included: colors scheme, layouts, menus, typography, google font... can be tweaked quickly to suit any need. Now let's take a SJ iSingle tour to feel more!